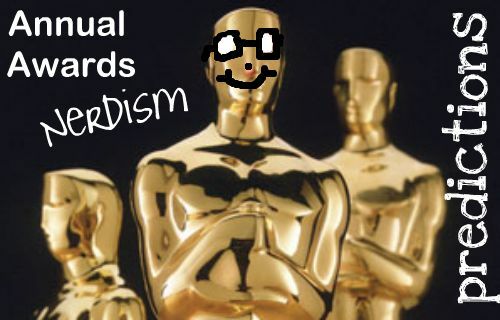 Welcome to Part Four of my Oscar predictions, the big one that Annual Awards Nerdism for 2011 has been leading up to. As there simply ain’t a way for him to lose. Last year, Colin Firth was nominated for his first time for his career defining, breathtaking performance in A Single Man. Jeff Bridges won the award, as he was ‘overdue’. This year, Bridges is nominated, but won’t win, because now Firth is nominated, and it would seem that he is ‘overdue’ thanks to what happened last year. Previous winner Javier Bardem doesn’t stand a chance, either. If I had a vote, it would have to go with either Jesse Eisenberg or James Franco. I feel like Eisenberg won’t have another chance like this, because his performance in The Social Network was like one of those once off kinda deals. I would like Franco to win, simply because he was given a D for an acting class assignment because he was filming 127 Hours. It would be like the ultimate shame if he won (for the marker, that is). But he should worry about hosting the show more. Unless the voters sanity has gone. I’ve heard a lot of people saying ‘Natalie Portman won’t win!’ this week. Where is this coming from? Not only has she won like every award, she has the most amazing performance out of the lot of them. The only reasons I can think of that will see her not winning are she’s either too young or an ‘overdue’ Annette Bening could win. I don’t want Annette Bening to win. Her character is just too bitchy. Jennifer Lawrence is awesome in Winter’s Bone, so I can’t exactly write her off. Having not seen Blue Valentine or Rabbit Hole, I can’t really comment on Michelle Williams and Nicole Kidman being nominated. I respect them both as actresses, and I wish them well. If Natalie Portman doesn’t win? The voters have gone as insane as Nina. But did any of these actors lose lots of weight? Even if this isn’t the best film he’s ever been in. Yeah so, Christian Bale will win. The only competition he has is Geoffrey Rush, who won the BAFTA. But that can’t really taint his chances, surely? I may have doubted John Hawkes before, but since seeing the film I thought he rocked. Though, I could have replaced him for an Andrew Garfield nomination. I haven’t seen The Town, but I’m glad that Jeremy Renner got another nomination for the second year in a row. He’s such a brilliant actor. Mark Ruffalo is awesome, too, but I’m more surprised that this is his first nomination. Maybe I overrate his brilliance, but the guy could be classed as ‘overdue’ too. Christian Bale deserves it most, though. But an Amy Adams win shouldn’t be far away? But who could win, I don’t know? Go for the underdog, JACKI WEAVER! It’s the same everywhere. Anyone who has seen Animal Kingdom will agree that Jacki Weaver delivers the best performance out of all of these lovely ladies, but the size of the project and perhaps the country it hails from hurts her chances. My next choice would have to be Amy Adams. She has been nominated three times, in this very category, without any luck. With this being her best performance, surely they would give her the gong? Well, I hope they do. But her costar Melissa Leo will get it, as she has got everything else, unless her self-advertising controversy stalls her. Hailee Steinfeld is becoming a likelier choice by the day. The problem is, she is essentially the lead role, so she should have been nominated there, and it just won’t seem fair if she wins. Helena Bonham Carter is also likely, after her BAFTA win. She could have the ‘overdue’ cloud hanging over her, which could get her the votes that Melissa Leo lost. Maybe I just don’t want Leo to win. There's todays lot...the second time I've written it (stupid Blogger deleting it all as soon as I published it). Tomorrow I will rank the Best Pic nominees. See you then!